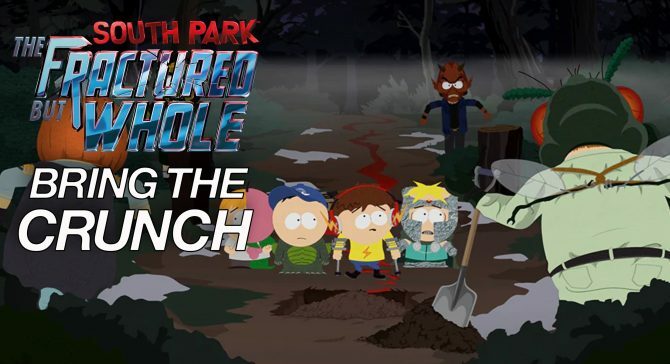 South Park: The Fractured But Whole's Bring the Crunch DLC moves the superheroes to a horror genre, and is a must play expansion for series fans. 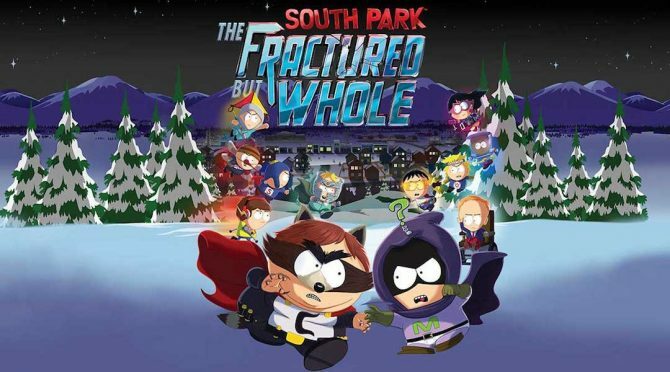 It’s been a while since I’ve thought about South Park: The Fractured But Whole. The game came out less than a year ago, but in that span of time we’ve had an E3, No Man’s Sky got fixed, and Fortnite took over the world. In other words, it’s felt like a gaming eternity. However, with the release of the new Bring the Crunch DLC, it was the perfect time to jump back into the superhero mix to see what The New Kid is getting himself into. 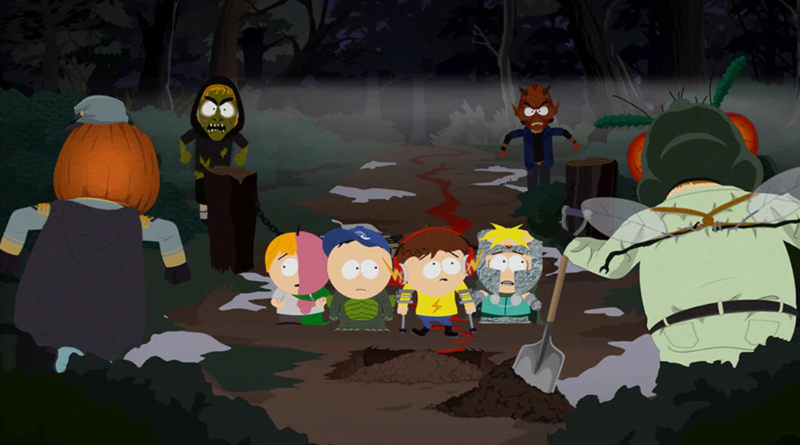 While the previous DLC’s focused on a challenge mode (Danger Deck) and a brand new, vamp-kid based story (From Dusk till Casa Bonita), the brand new expansion highlights Bradley Biggle — better known as Mint-Berry Crunch — along with Jimmy, Timmy, and Butters and the camp aside Lake Tardicaca. After a troubling amount of disappearances, Jimmy is looking to investigate the camp to make sure that it won’t be bucked. 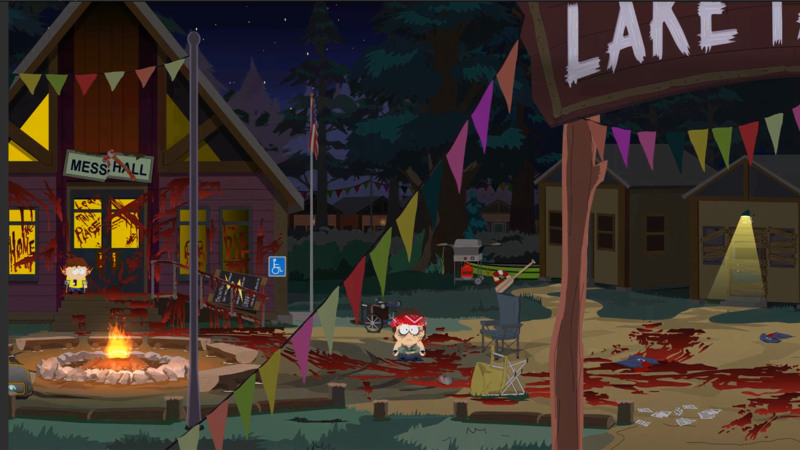 Little does the team realize they are stepping into a murder scene with nearly every camp counselor butchered and blood splattered across cabins. 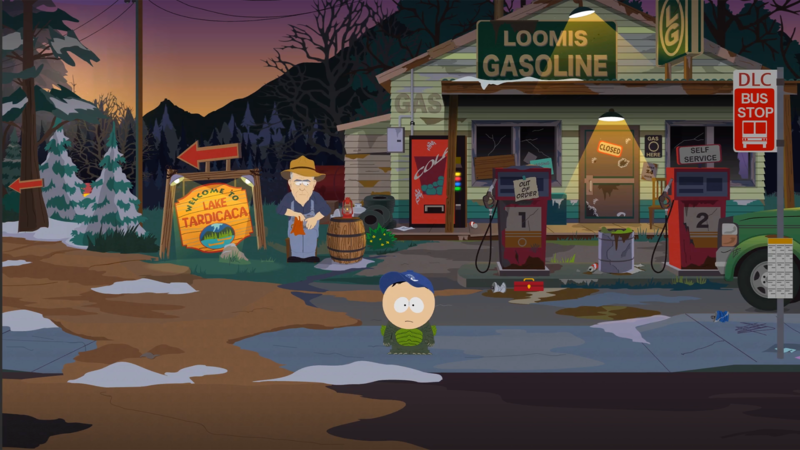 Of course, this doesn’t phase the world of South Park. Through the entire Bring the Crunch DLC, the team of superheroes continue without a care, trying to find at least one counselor who is still alive so camp will be saved. The story lasts about four or five hours, with a self-contained map and a handful of missions that pads it out much better than either of the previous DLC. More importantly, series fans are still going to get their kicks from the expansions with more than enough cameos of fan favorites (including Old Farmer, the dude who is skeptical about going down any roads). Just like From Dusk till Casa Bonita, Bring the Crunch offers a new ability set: the Last Girl. Meshing well with the lake-side horror theme, The Last Girl’s moves mirror the bravery and courage of the last girl in any given horror movie. You know, the thrifty virgin that can make it to the end only to die in the sequel? Yeah, that one! Using some toolshed constructions, you can create some tactical buffs (like setting saw-based traps) or be able to direct the knockback of enemies. And while the moveset of the Last Girl was an interesting addition to the South Park: The Fractured But Whole repetoire, I couldn’t help but feel that it lacked something presentation-wise. Though the story and combat are as fun as the original was, I noticed that the balance between combat and puzzle solving seemed a bit off. In From Dusk till Casa Bonita, there was always a fun mix of back-and-forth between the two, with nothing ever feeling unbalanced. Meanwhile, Bring the Crunch feels exceedingly puzzle focused, even in combat sections. Sometimes my eyes would glaze over with a few of the less-interesting fetch quests or fart-based puzzle scenarios. None of them were particularly dull or uninteresting, but it felt like a lot packed into the short experience. 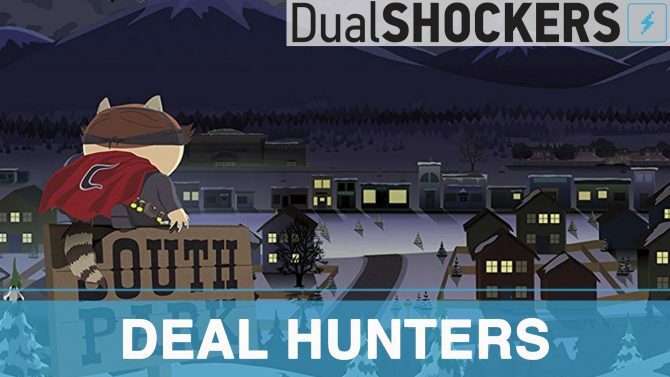 Even with that issue, it’s hard to deny that South Park: The Fractured But Whole — Bring the Crunch is the best pack of an already solid DLC pack; summer is the time to return to games that have passed you by. And if you haven’t gotten a moment to jump into either this or the Casa Bonita, there is a solid 10 hours of gameplay combined. Even better, Bring the Crunch works terrifically as a self-contained story, so people who have simply dropped the game after beating it (like me) can pick it up and play effortlessly. 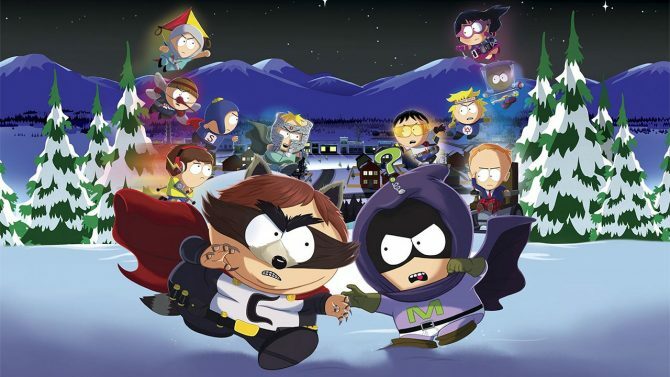 Bring the Crunch is another notch in the belt for South Park: The Fractured But Whole, offering fans another reason to come back to Colorado. Sure, if you aren’t a huge fan of the first game, this DLC isn’t going to change your mind. But this horror-themed storyline is going to be enough to keep most series’ fans going until the next season starts up.